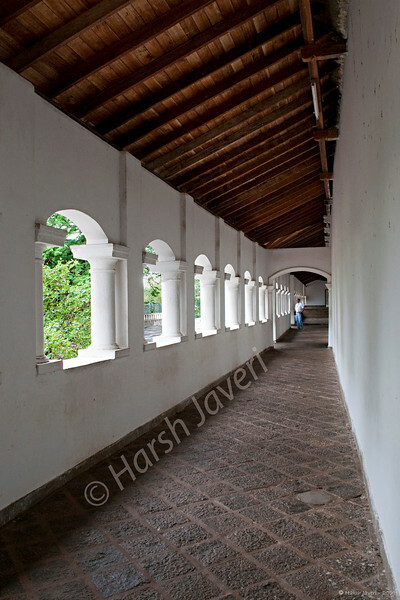 This is the corridor that leads to the five caves of Dambulla rock temple. The rock towers 160 m over the surrounding plains.There are more than 80 documented caves in the surrounding area. Major attractions are spread over 5 caves, which contain statues and paintings related to Lord Buddha and his life. There are total of 153 Buddha statues, 3 statues of Sri Lankan kings and 4 statues of gods and goddesses. I like all of the lines and earth tones. very nice peaceful corridor. Love the flooring. Beautiful shot...great composition, the lighting and the lines along with the row of windows keep your eyes flowing threw out the picture..
Great repetition and light...love the comp!